The Bobble Stitch is a great, fun crochet stitch that will add pizzazz to your next crocheted piece. It’s easier than it sounds, so grab your hook and let’s get started! When crocheting the bobble stitch, we are pulling up a series of loops that we will then pull through all at once. Since the bobbles are worked on the “wrong” side of the fabric, this makes the stitch puff out on the opposite side of the work, making it into a little “bobble”. We can use these bobbles to create designs, spell words, or just to add a bit of flare to crochet. This stitch is a bit of a yarn eater, but its so worth it. Isn’t it pretty?! 2. Repeat number one in the same stitch/space until you have a total of 6 loops on your hook. 3. Yarn over, pull through all 6 loops at once. (It helps to keep this part a bit tighter than the rest. 4. Single crochet in next stitch. Each bobble stitch is followed by another, shorter stitch (the single crochet) because that will help that bobble really “pop” through to the other side. How you start the next row will depend on what pattern you are following. 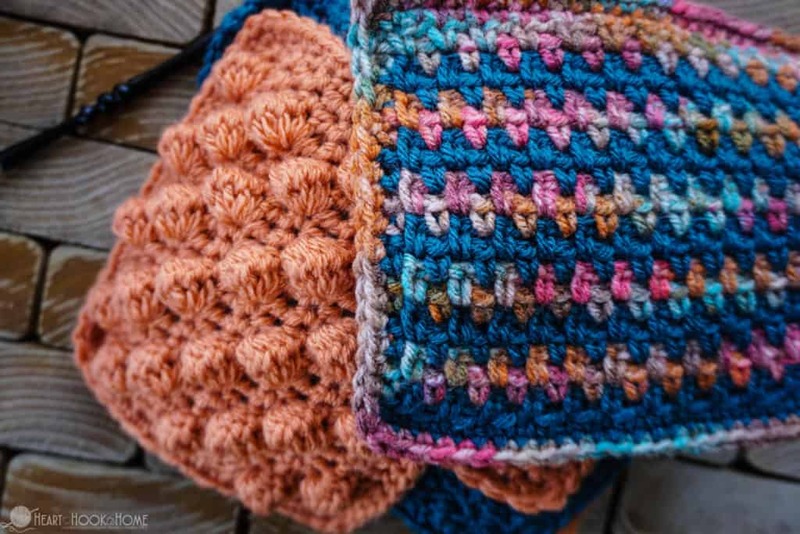 Some patterns call for Double Crochet while others call for Half Double, or even a single row or Single Crochet if the bobbles are intended to be very close to one another. The taller that row in between each bobble row, the farther apart the bobbles will be. 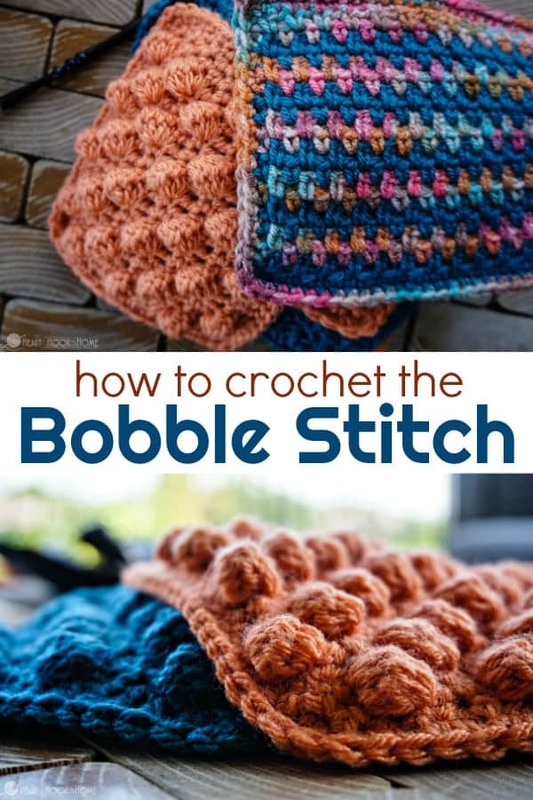 Want to see the bobble stitch in action? Here’s a VIDEO tutorial! I am using the Bobble Stitch in my new stitch sampler blanket pattern, Creighton’s Blanket. This blanket is completely customizable, simply crochet as many squares for the size indicated here, and then connect the squares, slap a border on it, and call it a blanket. So fast, so easy, and an awesome project for those warm summer months when you don’t want to work on a large project. Hi, I love your blanket. 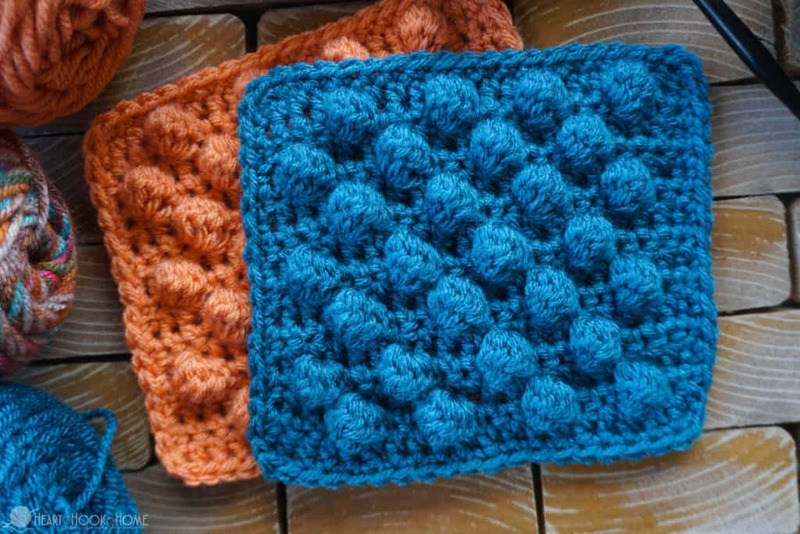 Would you please let me know which stitch you used in your dish cloth example- the bobble stitch, the single crochet right afterward then start the bobble stitch again - right after the single crochet- correct? Then you mention that we can choose whether we would like to do a subsequent row of single, or double crochet. Which did you use in this subsequent row in your bible stitch sampler and video? Have you ever tried a triple crochet here? I like your sampler- would you tell me what stitch you used in the subsequent row? Would it be possible to send me the written pattern, please? Thank you so much for the tutorial on the bobble stitch. Now that I have watched you do it I find it IS easy, but I watched some others before this and they went so fast and explained nothing. Left my head spinning. Again many thanks. I am so glad you found my tutorial helpful! The bobble stitch was what I use on a baby blanket but ended up re starting on the right side for every row having to sew the loose ends in . Thought there must be a way to work this stitch so the bobble was always on the front ,on one side. You have shown me the easy way to do it , thankyou . Hi Penny! I'm assuming you are asking about the blanket pattern...in which case, I will have an ad-free version soon.